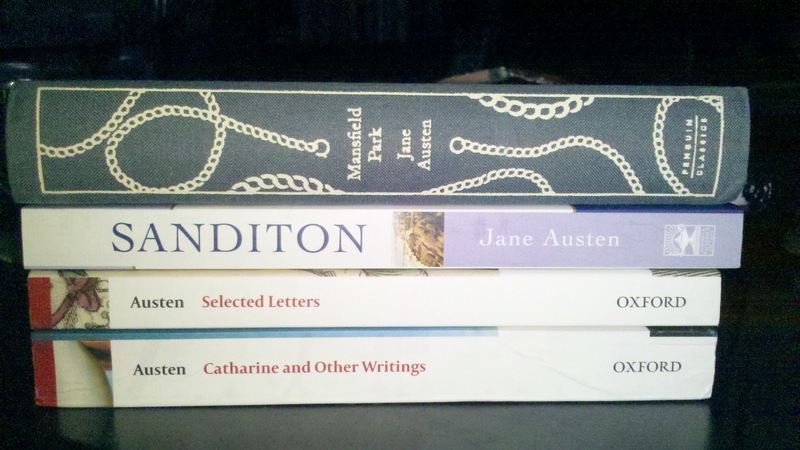 A Literary Odyssey: Austen in August! A few weeks ago, I was chattering with Adam of Roof Beam Reader on twitter about some reading events, and he said he was thinking about hosting a Jane Austen event in August. Count me in! I've been anxiously waiting for the announcement post, and I did a little jump and skip at work today when I saw it went up. :) And while my employees laughed at me, I jotted down the four books to pull off my shelf so I could write this post as soon as I got home. Yes, I am very excited about reading some of Austen's works! Mansfield Park: I have only read this title once, and it was quite a few years ago. I'm looking forward to revisiting it, since I remember enjoying it. Sanditon: I just picked up this copy a few months ago in my quest to get my hands on all her writing (I'm close...I think I am only missing The Watsons now...), and the premise of it sounds super interesting! Selected Letters: I really want to make it a point to get to this one, since I think reading her letters will be absolutely fascinating! Austen was an interesting woman! Catharine and Other Writings: This is actually a collection of her complete juvenilia, so I am hoping to spend some time with some of it. I haven't heard as much about these writings, so my curiosity is piqued! otherwise, great list! I look forward to your posts. I've only read one Austen title. Oh gosh, isn't that an embarrassing typo. ;) That's what I get for not reading it over before I posted! And only one! Egads! Austen is awesome! Another Austen in August reading event announced also at Indie Jane for those interested... welcome! Glad to hear about it! Thanks for letting us know! I've never read the letters or the juvenilia. . . but I got that exact edition of Mansfield Park for my birthday! I'm probably going to read a nonfiction book about JA, I have MANY on the shelves. Probably Jane Austen and Crime. You know, I don't have ANY non-fiction about Austen...hmmm...I should remedy that. Enjoy the collection of juvenilia, some of it is great, and her history of England is rather funny. I Sanditon is wonderful, it's such a pity it was never finished as what there is is so promising. I... have.... never.... read.... Jane.... Austen (donthitme!). I promise to read one of her novels in August! I've not been able to finish Mansfield Park yet - don't know why. Just never got into it. I will try to join in - probably read Persuasion as part of Austen in August. A couple of years ago, I quite enjoyed alliterative reading months (e.g. Female authors in February, or Mystery Writing in May), so, this works quite well!